Various spots: in the terracotta pot near the clothesline, and starting to pop up in the compost heap near the shed, and even in the lawn along the back fence. Fine by me... 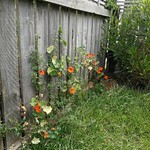 I love nasturtiums and would be happy to have them all over the place, especially if it means I don't have to mow.